After my positive experience designing and building my three-way semi-active speakers, I started rebuilding my electronics, which has turned into a long-term project. Although this is the kind of thing I love doing and find very satisfying, I did miss the hands-on woodworking involved in building the speakers, so I started (as I do) speculatively planning my next project. The more I started to think about it, in fact, the next step seemed more and more obvious. We have been talking a lot recently about getting a DVD player, and at the same time we are planning to redecorate the living room. This will give us the freedom to build in a subwoofer, for example, and also lets us add extra mains points and wiring. We could of course buy a set of surround speakers, but this would be no fun, and far poorer value for money than a DIY system. Building the speakers myself would also let me tailor them to our own requirements and tastes. That leaves that last decision: whether to use active or passive crossovers. I have to say that the most fun I had building my speakers was in making the boxes, but the bit I have enjoyed least in my electronics rebuild has been the metalwork. This points us in the obvious direction of building the amplifier for each speaker inside the speaker box. This has the added advantage of reducing the amount of speaker wire to zero (to the nearest metre, that is!). Of course I'll need a lot more interconnect, and that will open up the risk of picking up noise, but I'm quite happy with balanced interfaces. A few years ago I was looking for a pair of medium-sized speakers, and after listening to a range of similarly-priced models from Epos, Snell, KEF, Castle, Acoustic Energy and others I bought a pair of ProAc Studio One Mk. 2's, which to me sounded the most natural on the kind of classical music I like, as well as nice and boppy with rock and jazz. Although they deservedly have a high reputation for their higher-end speakers like the Response 2.5, 3 and 4, ProAc have also made a name for themselves with their high-performance miniatures like the Tablette and Response One. These latter speakers don't (to me at least) have enough bass to be really convincing, have limited power handling and are punishingly inefficient. All the same, they can sound very impressive, with nice tonal colours and terrific soundstaging. Here is the Stereophile review of the ProAc Response One SC . There are other high-quality miniatures, of course, including the classic LS3/5a, and the even more diminutive AVI NuNeutron (review here). The demands of an HT system are, however, rather different from those of a stereo pair of speakers. A 5.1 channel setup encourages the use of small satellite speakers (particularly in the average undersized British living room), whose shortcomings in heft are - in theory - made up for by the subwoofer. In practice, what you get in the majority of systems is a set of tiny satellites with cheap drivers which hardly reach below 100Hz and vastly exaggerated power handling, (ill-) matched to underdamped boom-box with similarly unimpressive real world specifications. The opposite extreme, of course is the audiophile HT system where full-range speakers are used for all five main channels and a subwoofer which is 3dB down at 20Hz. A practical compromise in a smallish room is to use five small speakers, of similar dimensions to those I mention above, with a modest subwoofer. The most impressive small-scale HT system I've heard was in the ATC room at the 2001 London Hi-Fi Show, where they were playing a DVD of a Roy Orbison concert through their smallest system, the Concept 2. This opened me up to the brilliantly simple idea of an active surround system, although the ATC setup would have been well outside my budget. I plan to use a single woofer in the four left and right speakers, and to double them up in the centre channel to get a symmetrical polar pattern. The centre channel speaker will have to be magnetically shielded, since it will live directly under the TV. Since I want to keep a consistent tonal balance between the five surround speakers, they should all have the same drivers (hence simplifying the the system design process as an added bonus); this implies that all the drivers will need to be shielded. Lynn Olsen's Ariel and ME2 use the Vifa P13WH-00-08 midbass, which seems to be one of the best value small drivers of its type. It has a nice flat response, although the amount of bass is going to be limited by its high fs. Lynn uses two of them in the ME2 in a 8.5-litre box with a 10.5cm long, 2.5cm diameter port, having aimed for a Quasi-Bessel 4th order alignment. The one big disadvantage with the P13WH in the present context, however, is that it isn't magnetically shielded. Vifa have a shielded midbass of the same size, the M13SG-09-08, but this appears to have a treated paper dome, rather than the polypropylene of the P13W. However the two drivers are similar in most other respects, and the parameters of the M13SG make it well suited to a box of around seven litres, making it ideal for my application. Both the Vifa midbass units show a nearly identical 3dB dip at about 1.3kHz (see the dashed green line in the plot above right), which is probably related to the cone geometry - the cone diameter of 13cm is almost exactly half a wavelength at this frequency. Audax have a small shielded tweeter at a very competitive price, the TM025F1. This is used in several HT projects, not least Audax's own DIY system, designed by no less than Joe d'Appolito, as well as in projects from Adire Audio and Solen. The relatively small radius of this driver allows a small baffle, as well as allowing the two drivers to be moved close together for a better polar response. 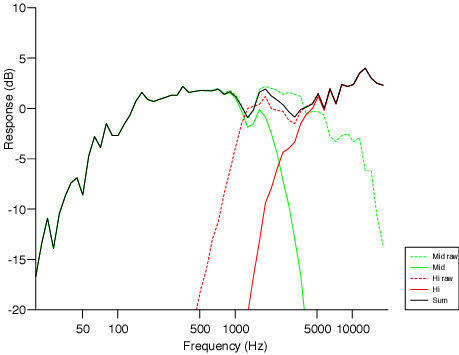 Its only major disadvantage is its relatively high FS, which the impedance plot suggests is at about 1.2kHz. This will restrict how low a crossover frequency can be used, but this may not be too much of a problem with a fourth-order crossover. The manufacturers' frequency responses for the two drivers suggest that they might make an excellent pairing. A fourth-order Linkwitz-Riley crossover at 2.25kHz gives a nice-looking combined response (above right). 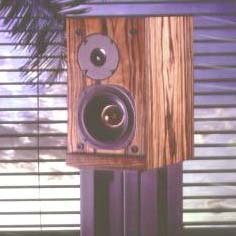 The mid-treble balance of these speakers may be tweaked to personal taste by playing with the level of the tweeter feed. The upward tilt in the treble response can be countered by setting up the speakers so that the listening position isn't on axis - the TW025F1 falls off quite smoothly off axis. It's interesting to compare two highly-regarded miniatures in this respect, the ProAc Response One SC (left) and the LS3/5a (right) as measured by John Atkinson for Stereophile (note the enlarged vertical scale). The ProAc has rather a "saucer-shaped" response, peaked at the low and high ends, to be contrasted with the BBC's rather flatter response, with only a minor peaking at the woofer resonance frequency and a mild depression in the upper bass. I would expect these two speakers to sound different, with more apparent "air" and detail in the ProAcs, but a more neutral sound from the BBCs. The rough response of the classic KEF tweeter in the latter is apparent compared with the smoother response of the newer ScanSpeak unit in the ProAc. The difference is also clear between the cabinet loading of the two designs: the port-loaded ProAc has a lower bass extension, but a faster LF rolloff (-3dB at about 58Hz, but -20dB at 33Hz), while the BBC's closed box alignment gives a limited LF extension but a slower rolloff (-3dB at 75Hz, -20dB at 27Hz). The M13SG-09-08 is designed to be used in a small ported enclosure. I modelled the response of the driver in boxes from five to ten litres, and the plot (above right) shows the response with the port length that gave the flattest response. 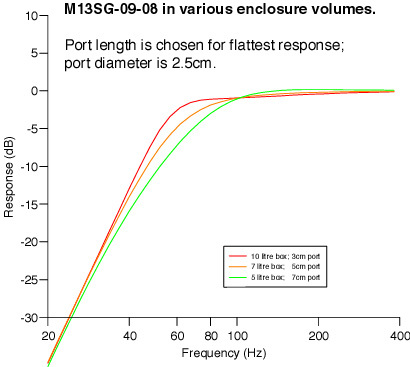 In the smallest box the rolloff starts well above 100Hz, with its -3dB point at 80Hz, while the largest box only has a flat response with an unfeasibly short port; the -3dB point with the latter is at around 60Hz. The seven-litre box is a good compromise between bass extension, flatness and acceptable box dimensions in a small living room. With this alignment the -3dB point is at about 70Hz, and -20dB at 32Hz. An obvious way to provide active speakers with on-board amplification is a chip amplifier. Quite apart from doing away with the necessity of a PCB (though I'll still need one for the crossover, of course), this has the advantage of providing current limiting and thermal overload sensing circuitry which should help protect the speaker coils, and should be more reliable in the long term than a large handful of discrete devices. I have read a fair amount recently about the 47 Labs Gaincard, which uses a chip amplifier in a rather unorthodox application to give a high sound quality (albeit at a price completely at odds with the parts cost). A small army of enthusiasts has appeared around an industry of deconstructing and reconstructing the Gaincard - see the Gainclone site, as well as this one. These recommend the LM1875 20W and LM3875 50W chip amplifiers for their sound quality and (relatively) purist architecture, and the LM1875 seems well suited to my plans (and at £3.99 each turns out to be among the cheapest parts of this project!). The limited power output of these chips shouldn't be a problem, as using an active crossover will drastically improve its efficiency. Of course, the higher-power 3875 would give a wider dynamic envelope, but will of necessity dissipate rather more heat, and there won't be much space for a large heatsink on the back of these little speakers. I am currently rebuilding my active crossover system, adding the facility to select both the frequency and the height of the baffle step. From the start I intended this to be a general-purpose device, not necessarily aimed specifically at my existing speaker system. It will be very useful in setting up the HT speakers, as it will let me find the best settings for the baffle step gain in particular depending on where the speakers are in the room. For instance, the front and rear pairs will be on brackets close to the respective wall, while the centre speaker will be recessed into an alcove (in other works effectively mounted in-wall), so the latter won't need appreciable baffle step compensation. The speakers will have selectable balanced (XLR) and unbalanced (phono) inputs for extra flexibility. As with my other projects, the balanced input will have no net gain. This will be an actively-driven subwoofer to live in the alcove below the TV and centre-channel speaker. For cost reasons, I expect to use a ported enclosure, in contrast to my plans for a subwoofer for my stereo system. I haven't given much thought yet to the choice of either the driver or the amplifier for this, except that the former will probably be 10"-12" (240-300mm) and the latter almost certainly won't be a chip amp (these aren't generally available over 50W or so, and also generally don't like being bridged into low impedances).